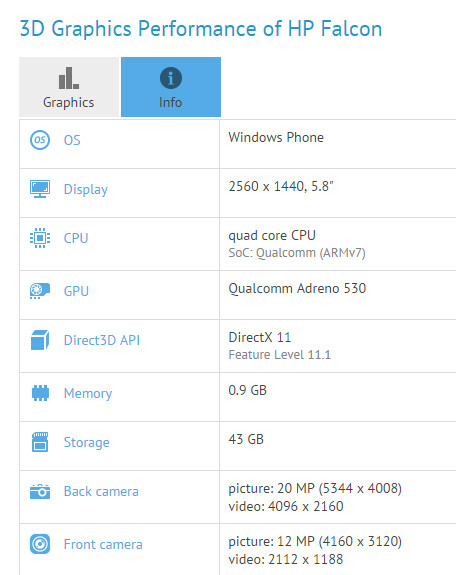 According to a recent discovery made in the GFXBench database, HP is working on a Snapdragon 820-powered Windows 10 Mobile phablet. Since this is the first time we're hearing about HP planning to launch a Windows Mobile/Phone device, make sure to digest this info with a double dose of salt. The mysterious device is referred to as the HP Falcon, and the specs listed in the GFXBench result point out to a premium phablet running Microsoft's Windows 10 Mobile. According to the leaked benchmark result, the HP Falcon features specs that include a 5.8-inch display with a resolution of 1440 by 2560 pixels, a Qualcomm Snapdragon 820 chipset, 2GB of RAM, and 64GB of onboard storage. In the imaging department, the HP Falcon appears to feature a 20MP primary camera and a 12MP selfie sensor on the front. Although HP currently sells a solid range of Windows-based tablets, the company has yet to launch a Windows Phone/Mobile device. After launching a few Android phablets in 2014 - as part of the mildly unsuccessful Slate Voicepad series - HP appeared to have lost its interest in the smartphone market. Last month, HP broke out in two separate companies. HP Enterprise is the entity that provides software and business services while HP Inc is responsible for the personal computer and printer businesses. In this context, the news that HP plans to re-entry the smartphone market doesn't appear to be very credible. On the other hand, the new Continuum feature that Microsoft has baked inside Windows 10 Mobile could, in theory, open up the way for HP to attack the enterprise smartphone market. The Snapdragon 820 is an ARM SoC, not x86. Full Windows 10 can run on 1GB RAM. This will run smoothly. they said they will use intel inside?